This species is accepted, and its native range is Peninsula Thailand to Philippines (Palawan). Widespread throughout the State. 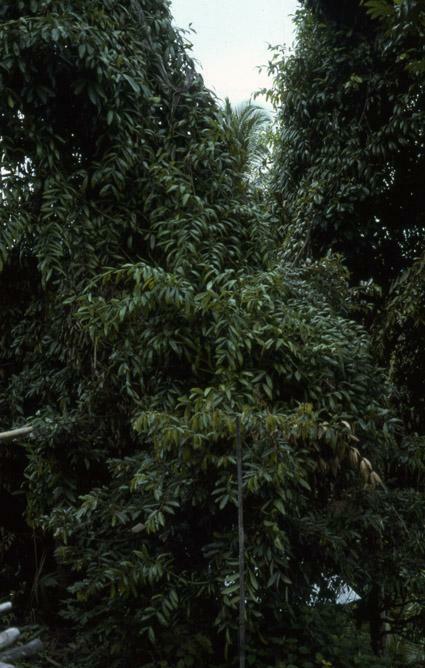 Elsewhere throughout Borneo, Sumatra, Peninsular Malaysia, S. Thailand (possibly introduced) and Palawan. 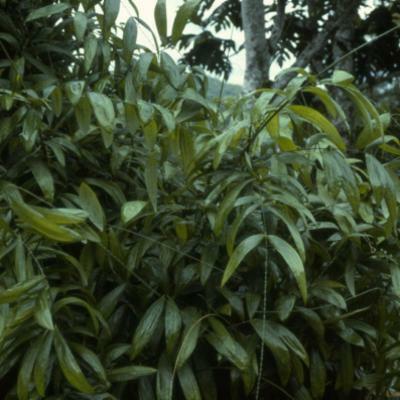 Clustering moderate-sized rattan climbing high into the canopy with stems ultimately reaching 100 m or more, the clump tending to be close and eventually with many aerial stems; stem without sheaths variable, 7-18 mm diam., with sheaths to 25 mm diam., internodes up to 50 cm (even longer in juveniles); cane surface highly polished, the outer surface snapping off in flakes when the cane is bent. Sheaths dull green, armed with sparse pale triangular spines to 15 x 5 mm and sparse grey indumentum, smaller spines sometimes also present; knee prominent; ocrea inconspicuous. 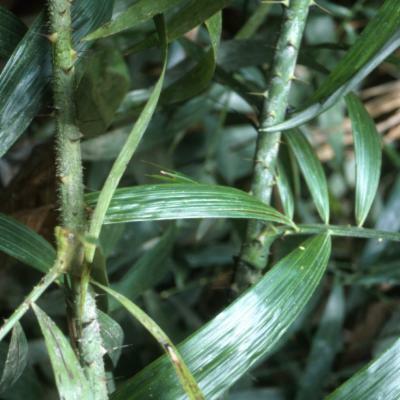 Leaf cirrate to 1.5 m including the cirrus to 75 cm; petiole present in juvenile shoots, absent in mature climbing stems; leaflets c. 15 on each side of the rachis, irregularly arranged, usually in alternate pairs, occasionally in 3's, dark green on the upper surface, white beneath, somewhat plicate, often cucullate, the longest to 30 x 5 cm. Inflorescences to 2 m with 7 or more partial inflorescences to 75 cm, the whole inflorescence sometimes ending in a divaricate axis to 20 cm; bracts tubular with sparse brown indumentum; female rachillae c. 10 cm long. Ripe fruit ovoid, c. 15 x 10 mm, with a beak to 2 mm, and covered in 15 - 21 vertical rows of greenish white scales drying pale straw-coloured. Seed ovoid, c. 12 x 7 mm; endosperm deeply ruminate. Seedling leaf forked, the two lobes parallel, 1/4 the length of the whole lamina, dark green on the upper surface, white beneath (Fig. 41). A very poorly known species, known only from west Kalimantan. 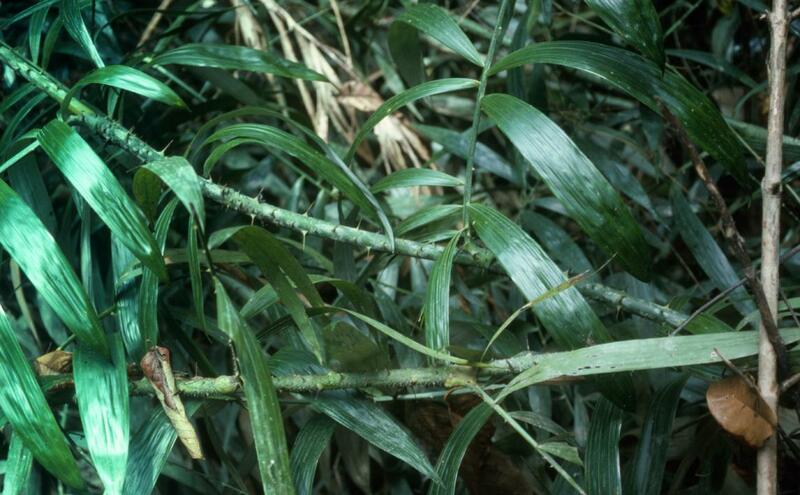 Habit - Climbing; not branching in the forest canopy; not dying after flowering. 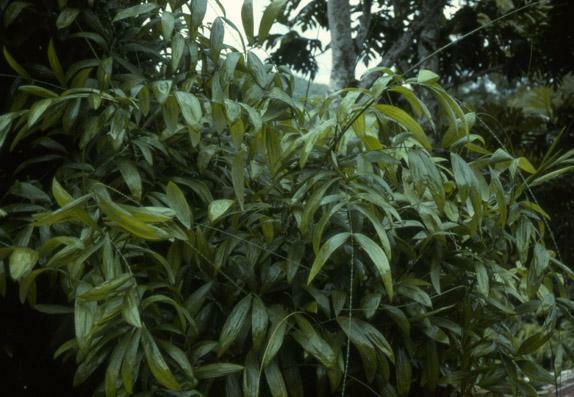 Plants dioecious. Leaf-sheath - Tubular for most of its length; flagellum long; knee present; with fewer spines than the rest of the sheath. Sheath surface lacking small horizontal ridges; without hairs or minute spines; green; scales on surface lacking. Leaf sheath with abundant spines; spines persistent; horizontally pointing; of more or less the same size; the larger spines tapered; the longest, excluding those at the mouth of the sheath less than 1cm. Spines straight; in life same colour as the leaf sheath; with smooth margins; the bases downswept and crescent-like. Spines mostly not grouped. Spines around the leaf sheath mouth scarcely different from those on the rest of the sheath. Ocrea - Absent. 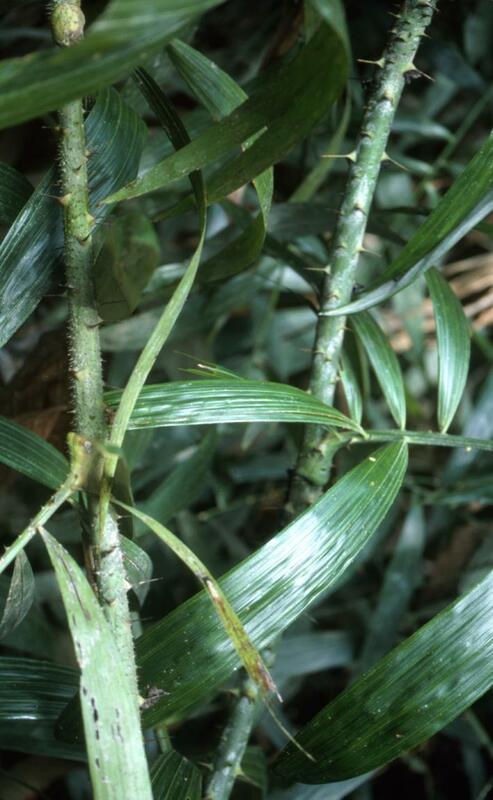 Leaf-stalk - Absent or usually less than 3cm. 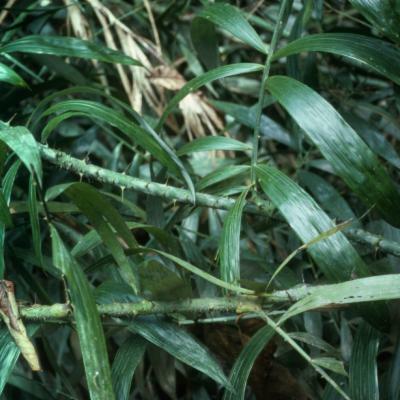 Leaves - Cirrate; rachis armed; not hairy. 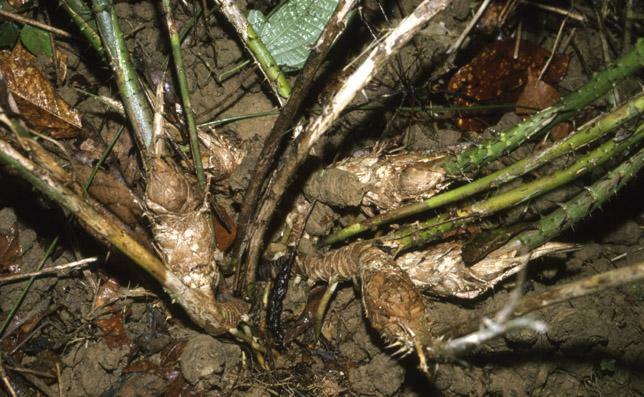 Undersurface of newly emerged leaflets same as upper surface. Scales absent from leaflet surfaces. Leaflets sessile; 1 to 10 on each side of rachis; regularly spaced and parallel; held in a single plane; lanceolate; the leaflet tip acute. 2 to 5cm wide; with none or very few brsitles; the margins with many bristles. Bristles not interlocking; stiff black greater than 0.5mm long. Leaflets scarcely plicate; the veins not radiating; midrib raised and prominent adaxially. 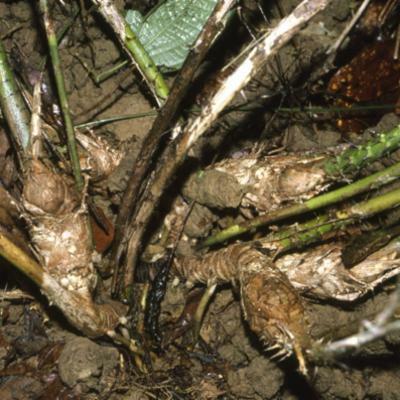 Lowermost leaflets not reflexed across the stem. Apical leaflets not or scarcely joined; not less than 4 cm long. Inflorescence - Inflorescence axis erect along the axis, with clawed spines on the primary bracts; not rooting at its tip; much shorter than the leaves; the first bract not enclosing the inflorescences at anthesis. Partial inflorescence present; bracts at the base of the partial inflorescences wholly tubular with a neat mouth or a small open limb, much shorter than the partial inflorescence. 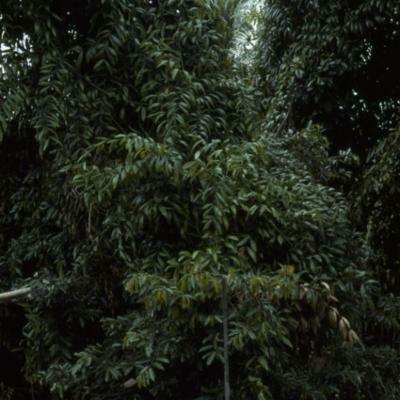 Rachilla lacking an enclosing bract; not at all pressed against the subtending bract. Flowers arranged in two rows. Female rachillae not congested; without conspicuously stalked flower cups. Bracts on the rachillae not net-like. Without doubt the best quality cane of its size class, ideal for all types of binding and weaving in the furniture industry and widely used locally in traditional weaving. Meyer, J.-Y., Lavergne, C. & Hodel, D.R. (2008). Time bombs in gardens: invasive ornamental palms in tropical islands, with emphasis on French Polynesia (Pacific Ocean) and the Mascarenes (Indian Ocean) Palms; Journal of the International Palm Society 52: 23-35.